I think if the longer-wave upper-trough system has strong-enough Jetstream boundaries between them and the sub-tropical ridge, a SSW is more likely to be isolated and not affect the weather layer so much. However, if convergence streams (near the tropopause) are weaker, higher temperature and wind anomalies may leak into the westerly belt. The polar jet I'm referring to. around 19-21 October - difficult not to believe it's an error from instruments or transposition of data? 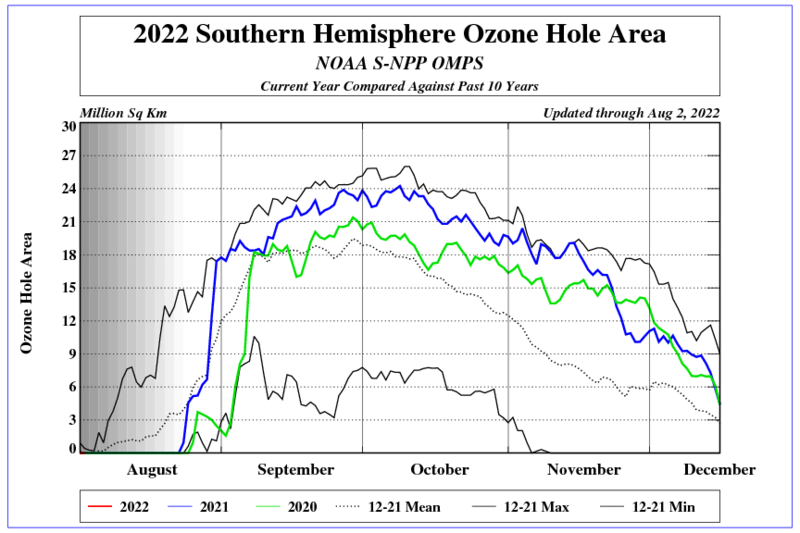 otherwise ozone hole disappeared for what..a day?...then came roaring back to finish at about level for 2016.Seems a bit odd. Looks as if were about to see the final warming and breakdown of the PV in next few weeks. I think this would be earlier than normal in the ozone hole era. Zonal winds look set to take a nose dive over the next week also. Smallest hole since 1988 confirmed! 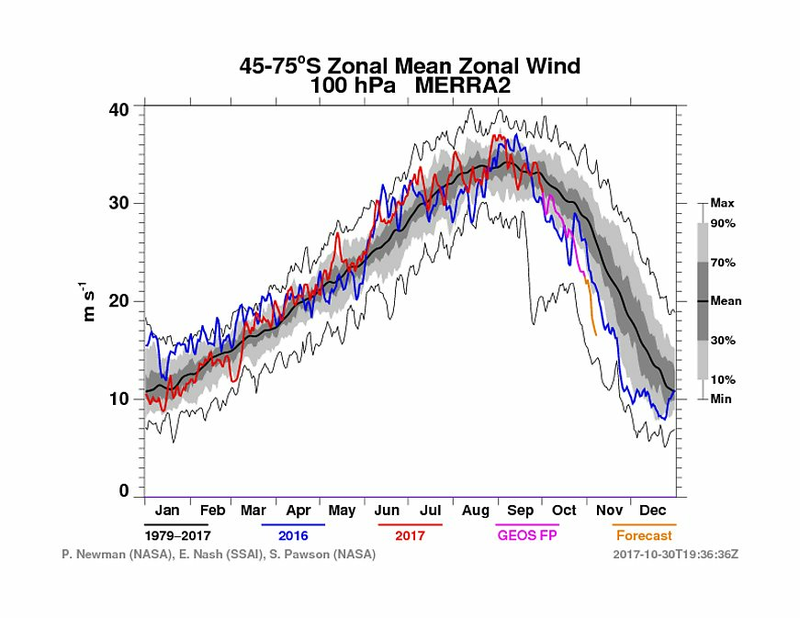 Zonal winds @ all monitored levels in stratosphere @ 60S as of 14/11 are still stronger than at same moment last year. 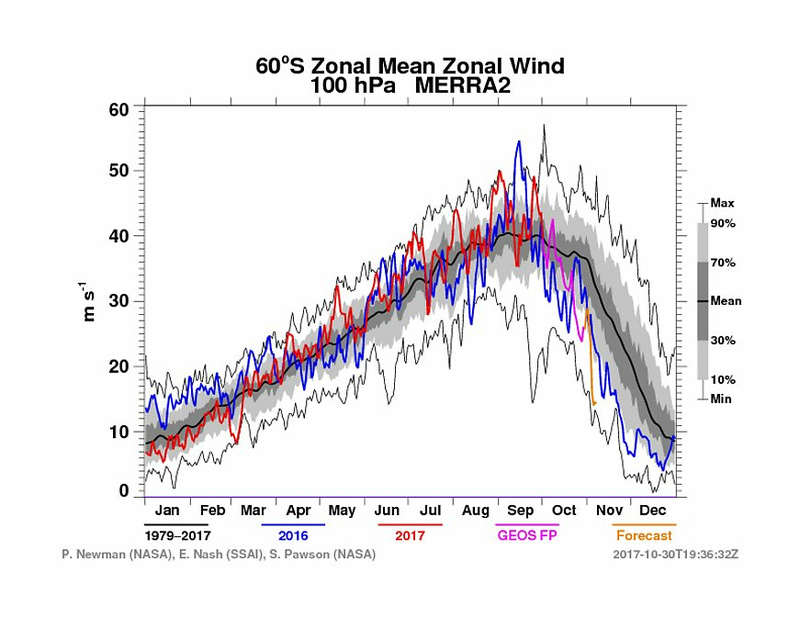 By current forecasts, Zonal Wind at 50hPa,(remembering one suggested proxy for final warming being winds declining to 1ms at that level), look to last a bit longer - by last week of Nov though easterlies will be present@10hPa(again the same forecast from nasa). If the final warming date of last year is known it might be possible to say if the above situation is a little odd - given the +ve anomylous heat flux the stratospheric vortex has been subject to this season, and the much larger ozone hole of 2016. 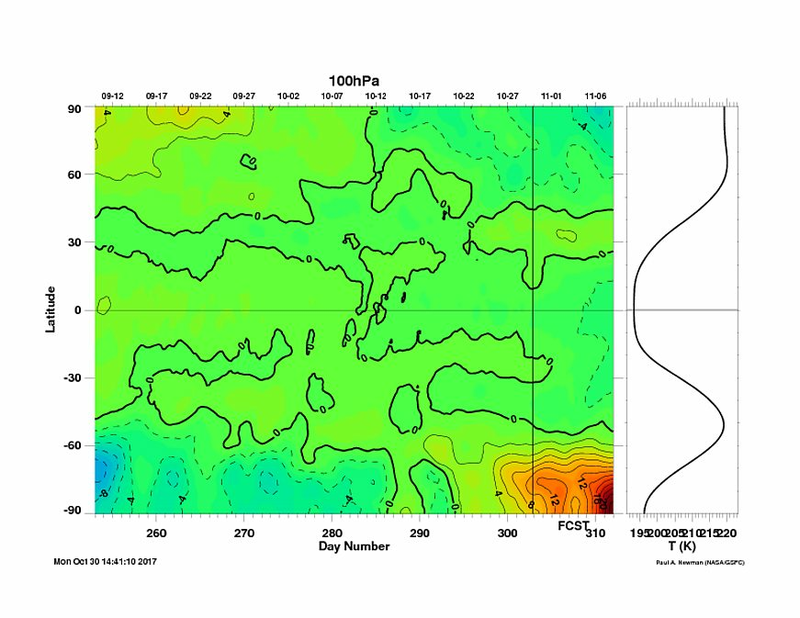 Currently into easterly phase QBO often associated with increased planetary wave activity in polar region.Always possibility of a weakened vortex and perhaps (hope)significant cold outbreaks later. May data should be released any day. Ok...thanks . Just curious about one thing -- you mentioned "possibly a result of strong wave 2 activity" -- is there a definition or something clearly linked that I can find somewhere about "wave 2" ? Thanks in advance for any feedback . I dont have any favoured reference. Wikipedia probably gives basic outline. Just a search on zonal wave 2 or similar throws up links that may be of interest. Thank you ... and thank you for clarifying. The word "zonal" does give me a better idea. It was because -- in the case of SSWs -- we're talking about the stratosphere [rather than the troposphere] that I was little uncertain. Also, with the exception of the Andes Mountains in South America, there is a lot less topographic forcing, which suggests other mechanisms at work. Two of those alternative options could be strong surface uplift and upper-tropospheric jet-stream activity . 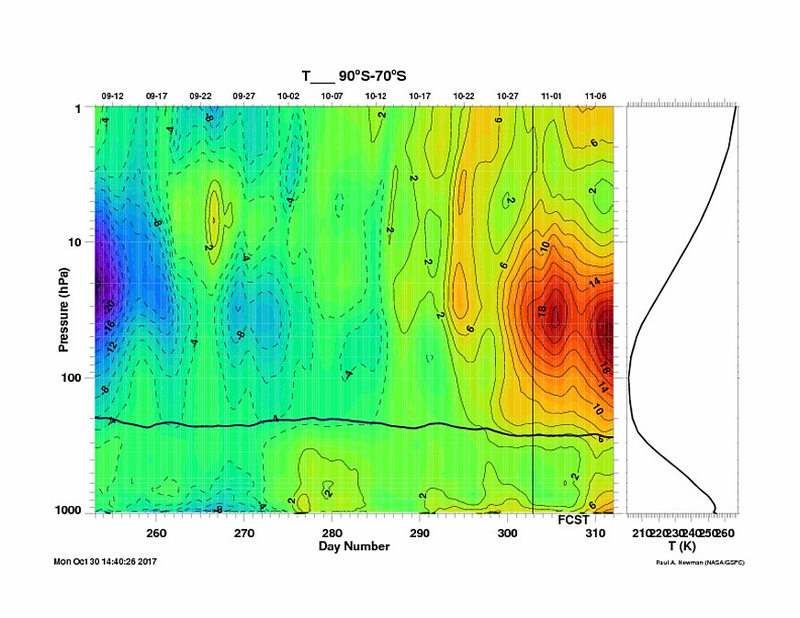 A bigger question might be what fraction of SSW events can be attributed to dynamics unfolding higher in the stratosphere, or the mesosphere, versus beneath them. I am not aware of any influence from the mesosphere myself - dont doubt it at all. = lingering winter pattern tropospheric mid-latitudes? I found references to the mesosphere [with SSWs] using Google. The other thing is that for there to be an intrusion of air between any layer (troposphere, stratosphere or mesosphere), the interface or "pause" between them would need to be altered. 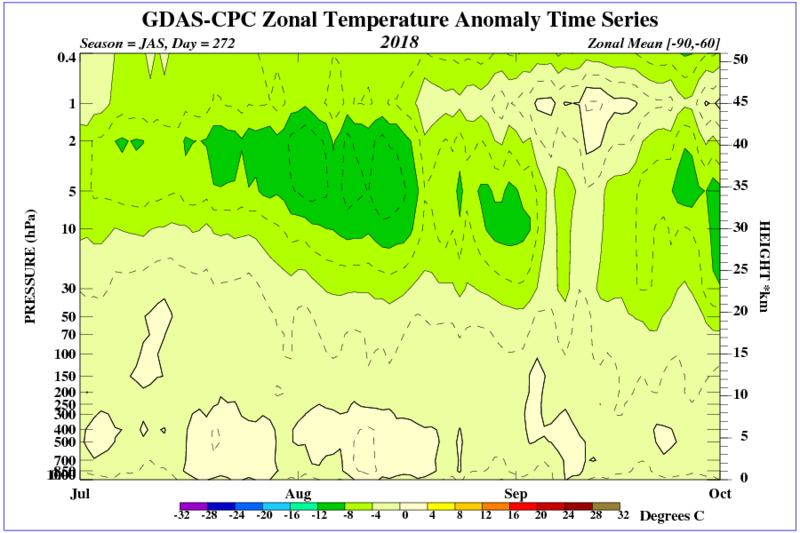 Spike in temp mid stratosphere polar region, according to Tokyo Climate Centre. They use nomenclature "over the south pole" - the National Weather Service Climate Prediction Centre page charts zonal mean for 60-90 and perhaps doesn't pick-up these sudden pin-point accelerations in temp.